Dirk Nowitzki is finally retiring after two decades with the Dallas Mavericks, and is secure in his legacy as the greatest-ever player from outside the United States thanks to 31,540 points scored, the iconic fadeaway jumper, his 14 all-star teams, and the 2007 MVP award. His once-reviled, or at least widely side-eyed style of play has now become the dominant mode in the NBA. Because it is how the league keeps track of things like this, there is also Dirk’s postseason track record—a heartbreaking failure in the NBA Finals in 2006 and a shocking early exit in 2007 and, of course, his lone NBA championship. Dallas’ 2011 title is unique among the past 30 or so years of NBA champions, all of which won behind at least a pair of dominant stars in their primes. That’s how it’s supposed to work, and has generally been the only way it has worked. Teams win championships with Curry and Durant, Jordan and Pippen, Kobe and Shaq. The two other outliers—the 2016 Cavaliers and the 2004 Pistons—were each still stocked with multiple star players; Detroit’s championship, to be fair, is probably as weird as Dallas’, since they did it more or less completely through defense. Not only were the 2011 Mavericks essentially Dirk Nowitzki and some other people, but they overcame the decade’s most significant amalgamation of superstars on their way to winning the championship. It’s worth remembering that, before they knocked off the Big Three Heat, many thought those Mavs wouldn’t even get out of the first round. Half of ESPN’s panel of experts picked the Trail Blazers to pull off a first-round upset, and when an injured Brandon Roy went for 24 in a series-tying Game 4 it seemed not just plausible but almost likely. That was the final season of Portland’s Gerald Wallace-LaMarcus Aldridge-Roy core, and though they were undone by injuries at every turn, those Blazers surely had the talent to compete with a rapidly aging Mavericks team. When the 2011 playoffs started, no player younger than 28 started or got serious minutes for the Mavs besides J.J. Barea; Jason Kidd, then 37, led the team in minutes played. The team’s two other twentysomethings, DeShawn Stevenson and Tyson Chandler, had both played in the league since they were 18. Dirk and Shawn Marion were 32, Jason Terry was 33, and even late-career Peja Stojakovic had to play an important role. For observers eager to do some narrativizing, the story this series should have told was an ascendant Blazers team notching a core-defining series win over a calcified Mavericks team. Instead, Nowitzki slammed the door shut with 33 points in Portland in Game 6. That set up a date with the Lakers, the defending NBA champions. This time, the entire ESPN panel was picking against the Mavericks, and Dallas’ old front line seemed no match for L.A.’s triad of Pau Gasol, Lamar Odom, and Andrew Bynum. It had certainly looked that way during the teams’ final two regular season matchups; the Lakers won both by a total of 33 points. For the first half of Game 1, it was more of the same, with the Lakers leaping out to a 16-point third quarter lead and overwhelming the Mavericks precisely as predicted. But then Dallas locked down on defense, came all the way back, and Nowitzki iced the game with two free throws. Kobe Bryant boinked several would-be game-winners, and the Mavs escaped. The sclerotic Lakers were clearly unprepared for Dallas’ defensive intensity, and Bryant warned, “This team can beat us, it’s clear.” Marion, Kidd, and Chandler anchored the NBA’s eighth-best defense that season, and their formula was to smother and disrupt their opponents while Nowitzki handled the heavy lifting on offense. Against the Lakers, Nowitzki shot 57.4 percent from the floor and 72.7 percent from three. None of L.A.’s big men bothered him, and Dallas limited the Lakers to 32 in the second half of Game 2, before the series headed to Dallas. The Lakers were up against the wall, and despite holding a seven-point lead in the last five minutes, they fell apart. 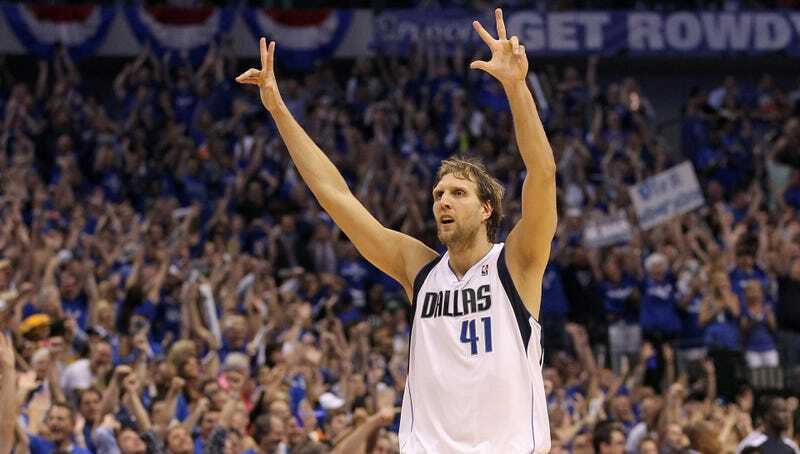 Nowitzki tore through them again, keying a game-winning 18-6 run that informally ended the series. One game later, Dallas utterly humiliated the Lakers with a 36-point blowout. Nowitzki didn’t have to do much, as Peja Stojakovic and Jason Terry hit 15 threes. Andrew Bynum ended his playoffs by clocking poor J.J. Barea. The Oklahoma City Thunder awaited in the Western Conference Finals. Kevin Durant, Russell Westbrook, and the rest of the team’s young core had won 55 games that season and overcome an impossibly resilient Grizzlies team in the second round. The Thunder’s ascension to the Finals seemed more a matter of when than if. Durant, even then, was an evolutionary Dirk Nowitzki who spoke about the tall German in reverential terms, and even called him his favorite player in the league in 2013. Again, the story was there to tell: a passing of the torch from one unprecedented big man to another. Again, Nowitzki was evidently not ready to go along with that story. He scored 48 points on 15 shots in Game 1, going a perfect 24-for-24 from the line and matching everything OKC could throw at him for 41 brutal minutes. He began the game by turning a corner on Serge Ibaka, then an elite defender, and slamming it in his face. Durant answered 40 of his own, and for the first time all playoffs, a team managed to penetrate Dallas’ armor and score more than 50 in the second half. It didn’t matter. Nowitzki simply kept drawing contact and splashing shots. Ibaka’s 7-foot-4 wingspan was hilariously ineffective against Nowitzki, who rose up and over time and time again. Nowitzki looked like a gangly stretched out Steph Curry—none of the grace, but all of the uncanny shotmaking brilliance. Nowitzki spent the rest of the series tormenting Ibaka in a similar manner. In Game 4, Dallas trailed for the entire game, and by 15 points with under five minutes to play. As they did all playoffs, they kept their heads and mounted a furious comeback. Nowitzki scored 12 during a regulation-ending 17-2 run, before the Mavs won in overtime. Game 5 was a similar story, as OKC led for most of the game until Nowitzki buried them with a dagger go-ahead three. In the Eastern Conference, the freshly assembled Miami Heat rolled through their first three playoff series with only three losses. They finished the regular season with the NBA’s third-best offense and fifth-best defense, then smoked the defending Eastern Conference champion Celtics and destroyed the top-seeded Bulls, who’d swept them during the regular season. LeBron James, Chris Bosh, and Dwyane Wade were all at their peaks, if not yet quite the symbiotic killing machine they’d become. There was history here, too: the Mavericks famously blew a 2-0 lead to Miami five years earlier in an extremely contentious NBA Finals, then followed that heartbreak with a first-round upset loss to the Warriors the next year. It felt before the Finals started that the Mavericks’ run, heroic and gutty though it was, would end in Miami. Game 1 sure felt that way. Nowitzki scored 27 against the ferocious Heat defense, but he also tore a tendon in his non-shooting hand while trying to strip Bosh. He insisted he’d be fine, though the Mavericks couldn’t afford to have him at anything but his peak. The Heat’s defense presented a new challenge for the relatively clunky Mavs vets; to counter that dynamic, Rick Carlisle eventually moved Barea into the starting lineup, a risk that swiftly looked like a legitimate moment of genius. The Heat seemed poised to capture a 2-0 series lead in Game 2, holding a 15-point lead with seven minutes left. Dallas couldn’t score enough to keep pace, and Miami simply looked too talented and too athletic for Dallas. But after Dwyane Wade nailed a three right in front of the Mavericks’ bench and celebrated right in their faces, the comeback kicked into gear. As they’d done several times in the playoffs, Dallas imposed its will on defense and hit threes on the other end of the court. Nowitzki scored the final nine points of the night for Dallas, and he even hit the game-winning layup with his fucked up hand. After the Heat took Game 3, the Mavericks desperately needed to hold serve in Game 4 to keep pace. There was a complicating factor beyond this being the NBA Finals and the opponents being the dang Big Three Heat. Nowitzki was running a 101-degree fever and battling a nasty sinus infection, and his condition became apparent in the first half, as his jumpers came up weirdly short. Yet again, Dallas came up huge in the fourth quarter, and though Nowitzki only finished with 21 points on 6-for-19 shooting, he scored 10 in the fourth quarter and won the Mavericks the game yet again with a waddling layup over a leaping Wade. Weirdly, LeBron James had perhaps his worst-ever playoff game in Game 4. He scored just eight points all game and took one single shot in the fourth quarter. James has, of course, now lost several Finals to dominant Warriors teams, though he’s never looked as lost and out of sorts as he did in such a critical game. His team could have pushed the Mavericks to the brink if he made even one more shot. He didn’t. The Heat were broken after that, and the Mavericks coasted to a comfortable win in Game 6, overcoming one of the most talented NBA trios of all-time to win the first title in franchise history. Overcome with emotion after finally capping off a career that had previously been defined by near-misses, Nowitzki couldn’t stay on the court when the game ended. He later told Zach Lowe he was barely even able to come back on the court after. He was too emotionally wrung out after finally reaching the pinnacle. Remarkably, Nowitzki’s 2010-11 season was the first time he’d started slowing down a bit since his first All-Star appearance nine years earlier. Nobody thought much of the Mavericks that season, and with the Lakers still in power, the Thunder and Heat on the rise, and Dallas’ core slowly aging out of relevance there was already the sense that Dirk was somewhere on the shoulder of his time as a championship contender. Teams like those Mavericks don’t win titles, and yet Nowitzki was good enough for 21 games to defy that logic. Someday, one transcendent NBA superstar will have the playoffs of a lifetime and win a championship through individual brilliance, which is not to say Dallas’ armada of role players didn’t also come up huge in that series. Maybe James Harden or Giannis Antetokounmpo will do it this year. But it will take something truly special to match up to Dirk Nowitzki’s magical 2011 run.